Imagine cole slaw's zippy older brother, and you're not far from this yummy veggie salad. Serve it as a side dish or a crunchy sandwich topper! Mix dressing, vinegar, salt and oregano in large bowl until well blended. 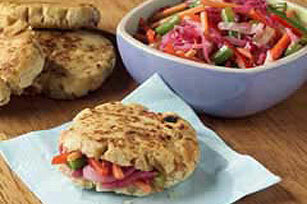 This coleslaw is traditionally served with the Salvadoran pupusa, a masa harina-based sandwich. The coleslaw is usually left in the refrigerator for a week to "pickle" to achieve the tangy taste that makes pupusas so distinctive. For varitey, add cooked beets, cut into matchstick pieces, to the cabbage mixture before chilling.